Ivory caskets of this kind were produced in Spain during the 10th and 11th centuries. They were made mostly for caliphs of the Umayyad dynasty, Muslims of Arab origin who ruled from their capital at Cordoba. The cylindrical shape of the casket reflects the form of the elephant's tusk from which it was made. It was given a domed lid, which is attached by metal mounts, probably of a later date. Both the body of the casket and the lid have all-over carved decoration, and traces of red and blue paint show that it was once brightly coloured. It may also have been mounted with small jewels, set in the drilled holes that punctuate the design. The main element in the decoration is the three large medallions on the body, each showing a man of high rank. In one, a man sits on a dais between two attendants. Another shows a mounted falconer. The third depicts a man sitting cross-legged in a palanquin mounted on an elephant. The lid, part of which has broken away, is decorated with small medallions containing animals. The lid also bears an inscription in Arabic. This gives the date of manufacture as the year 359 in the Islamic calendar, equivalent to AD 969-70. It also tells us that the casket was made for Ziyad ibn Aflah, who was prefect of police in Cordoba under the caliph al-Hakam II (ruled 961-974). This is the only ivory casket of this type that was made for a named person who was not a member of the ruling dynasty. Ziyad and his family were important figures at the caliphal court, and the caliph probably commissioned the ivory for Ziyad as a gift to be bestowed, like titles, on a favourite. Cylindrical ivory pyxis, with carved figural decoration and traces of paint. Three large medallions containing figural scenes represent a person of rank sitting on a dais flanked by two attendants, and carrying a sceptre; a mounted falconer; and a man sitting cross-legged in a palanquin on an elephant. 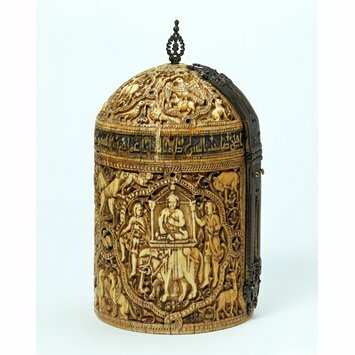 The lid was decorated with small medallions containing single animals, though a quarter of the lid has been broken off. Made for Ziyad ibn Aflah, Prefect of Police under the Spanish-Umayyad Caliph al-Hakam II, in the year 359 AH / 969-970 AD. Cylindrical ivory pyxis with domed lid and carved figural decoration, Spain (Córdoba), 969-970. Ivory, with traces of paint. The scenes in the large medallions represent a person of rank administering justice, hawking, and travelling in state. The inscription reads: "(The blessing of God) and prosperity and good fortune to Ziyad ibn Aflah, Prefect of Police. Made in the year 359." 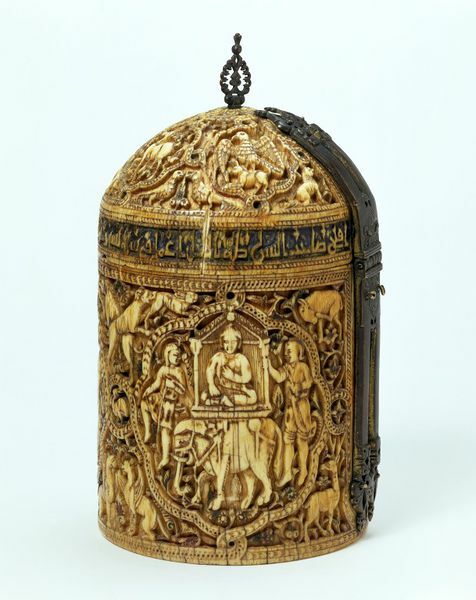 This is the only ivory casket from Umayyad Spain with a named owner who was not a member of the ruling dynasty. He was Ziyad ibn Aflah, the prefect of police in Córdoba. The depictions of court life under al-Hakam II include a ruler riding an elephant.